Thank you for hosting me, Michele. This is a fun blog and I feel very at home. Your causes are hot button issues with me. I’m a breast cancer survivor—visualize fist pumps here—and I ran a feline rescue in Maine. Six rescued cats (most special needs) call me their staff and four tropical birds provide backdrop tweets, caws, and dialogue to my writing time. Interviewers often ask when I knew I wanted to be a writer. The answer to that is as soon as I figured out that words could be strung together to paint images and pictures. Since I started reading at age two (my father would read me everything except Prince Valiant comics and that, of course, was what I wanted read), the concept of words translating to pictures took root early. Entertaining friends with made up stories followed quickly and when I learned to print, the stories went on paper. Life followed and writing continued, as a hobby. Something I did in the odd hours after work or the weekends when it was too cold or nasty to scuba dive. Something I would turn to full time when I had the time. You know, later. Newsflash—stop the presses—later is now. Don’t wait for it. During my treatment, I pulled out two of the full-length novels that resided in my computer memory and got to work. The first became Zoned for Murder, the second, Death by Blue Water. Zoned was ready for prime time, but the author wasn’t. The thought of getting an agent, finding a publisher, all of the back and forth and sheer, gut-wrenching pain of rejections scared the heck of out me. What if I lost my nerve? So I self-published what became the Catherine Swope series. 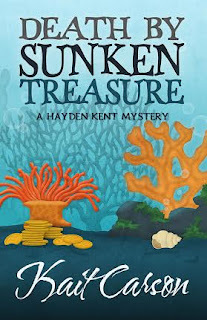 Emboldened by the modest success of the series, I took my courage in both hands and approached Henery Press with Blue Water and the Hayden Kent series. They bought it and suddenly, I had a traditional publisher. Now I’m ready for the next step in the process. The agent part. Fingers crossed—full steam ahead. How bad can it be? I’ve already shaken my fist in the face of death. That same spirit forms the character of both of my series heroines. They are fun, adventurous, spirited, cautious when they need to be, and ready for anything life throws at them. Catherine is a former cop who left the force after a traumatic shoot-out. In Murder in the Multiples, she’s found her niche selling high-end real estate in Miami’s hot market. Bad things can happen in expensive homes and Catherine puts her investigative skills to good use. Hayden’s had an easier life, but death haunts her too. 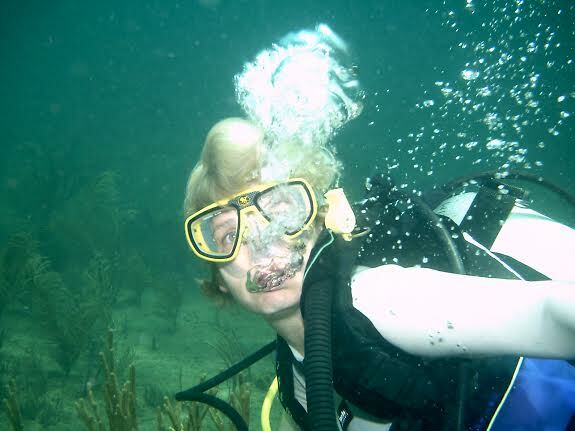 She battles her demons with frequent scuba dives that sometimes end in discovering bodies, or finding treasure among the clues. Each of my heroines is an animal lover. Both have rescue pets. Catherine shares her life with Paddy Whack, a cat who wandered into her front yard as a kitten and she turned into a house cat. Her dog, Bullet, was a police dog. She acquired him when his handler died and Bullet was deemed too old to adapt to another. He’s Catherine’s shadow and running companion. Hayden adopted Tiger Cat at the side of the Florida Turnpike. She spotted a tiny kitten huddled in the median next to a packing box. Fearing for the kitten’s life, she pulled over and discovered not just a kitten, but also a body in the box. That’s a story yet to be told, but Tiger Cat moved to the Florida Keys with Hayden and dines on Florida lobster from time to time. Having staff that scuba dives can be a useful thing. Pink and pets. The story of my life. What was your turning point? Kait learned to read at the age of two. Had to, her father wouldn't read her Prince Valiant in the Sunday comics. Her two favorite books are still Dr. Seuss's A Fly Went By and Louisa May Alcott's Little Women. Dr. Seuss was the first book she remembers reading, and the Alcott introduced her to Jo March, and exclamation points. Both changed her life. Kait’s working life proved just as varied. A seasonal job selling fine china and glassware in the Washington, DC area soon morphed into a move to New York City and a job with a high-end Italian gold jewelry import company. The call of the tropics took her back to Miami and a job working for one of Miami's most colorful characters as he and his Dallas Cowboy owning partner developed a national restaurant chain. A stint with the fledgling Miami City Ballet provided more grist for the journals. That led to years working with estate planning law firms and lessons learned in the front lines of litigation. She wrote five novels during this time, honing voice and characterization, learning scene and setting. The books, some masterpieces of head hopping, live under her bed. She loved them all. 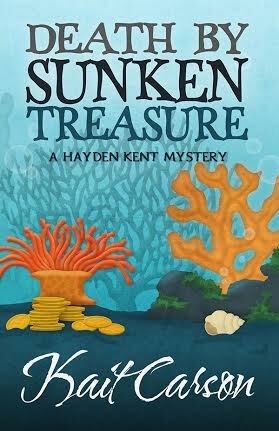 Today she’s combined her love of scuba diving with her love of writing to create a new series, the second book releasing this month: Death by Sunken Treasure. I'm fascinated by your courage! We should always follow our dreams and do what makes us happy no matter what! It is so great that your followed your dreams! I would love to write a book but I dont have the guts or time to sit down and do it. Maybe one day! You are right- the future is now. She is such an interesting author. I would love to read more. I enjoyed reading about Kait's journey to becoming a writer. I really believe reading to children at a young age ignites great things for them. What an interesting career journey!! I love to learn about what drives authors and inspires them to write. Enjoyed reading about your journey. I love to hear how someone got from where they were to were they are now. HI all, thank you so much for your kind words and support. I am sorry I didn't get here earlier--been a crazy day and spent part of it traveling. Coming home to read these great comments made it all worthwhile. It's people like you that make all the difference. Carrie, sit down and write that book. Do it for yourself if no one else. A page a day is a bbok in a year. I expect to hear from you in a. year that you're reading your own words! What a great blog. Miki--you are truly an amazing woman, and your have great readers! I totally love that her soft spot for animals has found its way into her novels. That's the best! It's so nice to share your experience and journey! Thanks for that. What a great story! I love to entertain and tell stories as well. Maybe I should start to write. This gave me motivation. I can write a page a day, I'm sure I can. Great story! I love reading about your characters and inspiration. I also think it is neat that you incorporate your love for animals in your writing.